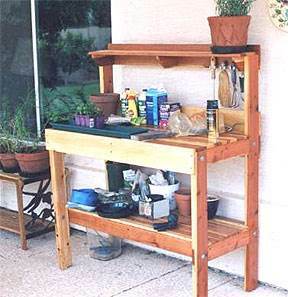 Customize a potting bench using the free plans below, building in features like cabinets and shelf storage to create the perfect potting bench. 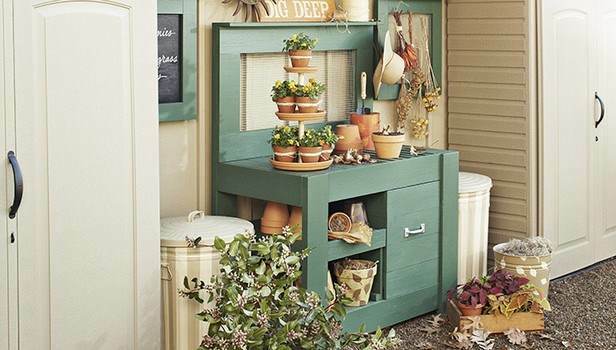 A potting bench can be a gardener's dream. 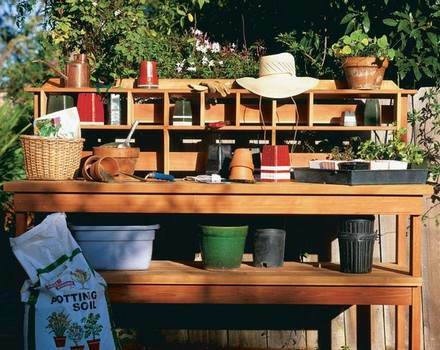 Gardening can be so much more enjoyable by having all necessary supplies and tools stored in one place. A bench to work on is an added delight and can last a long time. 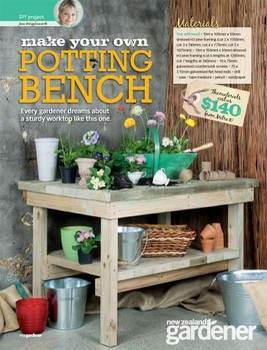 Step by step instructions with pictures will make building this simple potting bench a breeze. 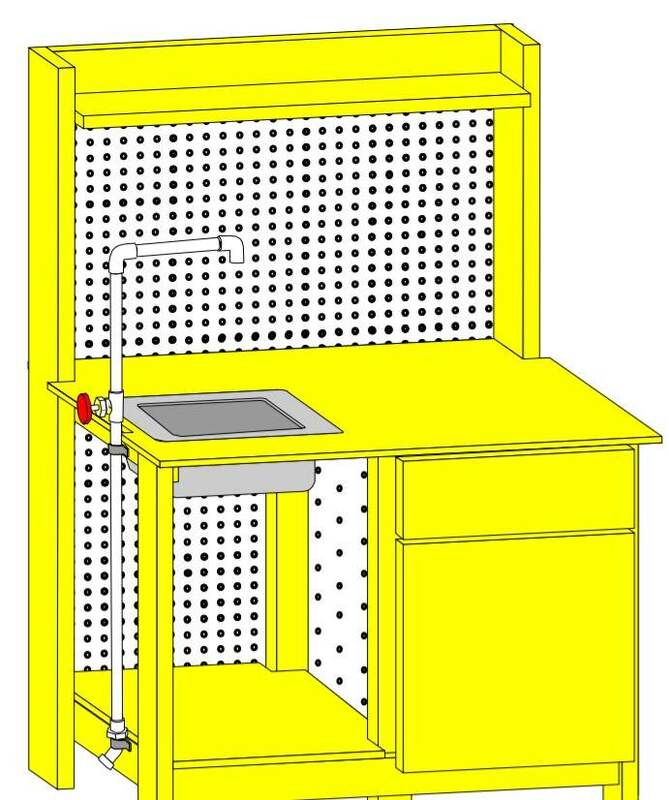 Create a bench with hardware cloth built in to the counter top for easy clean up, plus a top-shelf unit for storing gardening supplies. 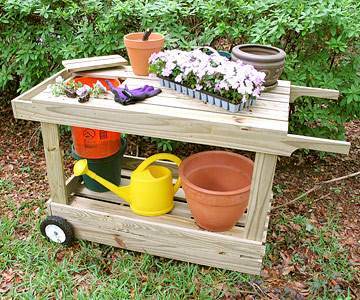 Build this wooden potting bench on wheels that has a storage area at the bottom and a potting surface on top. This potting bench has plenty of work space, plus two lower shelves, deep bin area, and a back splash with chicken wire for hanging gardening tools. 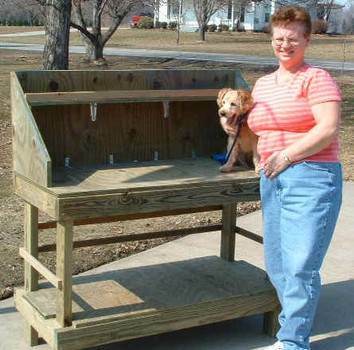 This woodworking plan has all the instructions required to create a two level potting bench with a single shelf using redwood or cedar. Create this outdoor bench with a 48" x 24" table top. Also there's an upper and lower shelf for storing large and small potting items. Potting bench plan to build a garden bench that offers a sink, PVC pipe for hooking up a garden hose, work counter, storage and more.